The Guggenheim is building a museum in the United Arab Emirates, and no longer wants to hear what activists think about it. Abu Dhabi, the glittering capital of the United Arab Emirates, is ascending to the pinnacle of soft power over the Persian Gulf. The city’s luxury resort, Saadiyat Island (Happiness Island), will, when fully built, serve as a regional arts hub featuring world-class branches of the Louvre, the British Museum, and the Guggenheim. But the nascent cultural oasis is also a notoriously brutal place to work for the site’s legions of migrant workers. The cultural-activist collective known as the Gulf Labor Coalition (GLC) has for years years worked to expose the dirty underbelly of the Emirati construction boom. 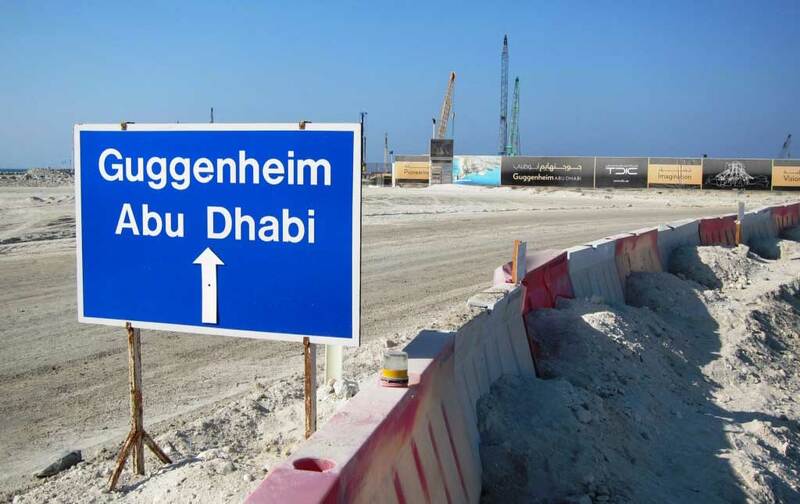 As a result of its pressure, it has been in negotiations with the Guggenheim leadership about safety and worker conditions at the Saadiyat construction site since 2010. But now Guggenheim leaders have broken off negotiations with the group as the museum moves into the construction of its new outpost. The “unilateral” breaking of ties follows several years of spectacular protests, including banner drops and civil disobedience at the main Guggenheim branch in Manhattan, agit-prop installations at the Venice Biennale, and extensive field research on shady labor practices in the UAE’s massive and highly exploitative migrant guestworker system. But now, the grassroots network of artists, filmmakers, and intellectuals have been cut off from talks with the museum authorities aimed at promoting fair labor standards on the site. The definition of the Guggenheim’s role, however, is at the heart of the labor debate surrounding Saadiyat Island. Paralleling the demands of international human-rights campaigns, the GLC’s agenda specifically targets the prestigious cultural institutions involved with UAE’s mega-development to hold them responsible for the systemic labor violations pervading the migrant-labor system in Gulf States. Although a contractor for the Guggenheim has reportedly not yet been selected for the construction by the TDIC, a recent labor auditing report by PricewaterhouseCoopers indicates that while the TDIC has promised reforms for several years, Saadiyat’s construction labor practices remain severely under-regulated and corrupt: Most of the construction workers surveyed—mostly imported from India and Pakistan on highly restrictive visas—had paid exploitative fees to labor recruiters, fees which are supposed to be prohibited; there were frequent delays and inaccuracies in payments; and the vast majority were reportedly unaware of their rights to raise workplace grievances. Labor and safety violations have been a major issue across the region, particularly in flashy development projects, from a luxurious New York University satellite campus on Saadiyat and the controversial World Cup Stadium in Qatar. Labor and safety violations have been a major issue across the Gulf Region. Now the waiting game has become a standoff. “I think the Guggenheim was at a point when they really couldn’t put us off any longer, especially since we brought all the NGOs on board,” says GLC organizer and NYU professor Andrew Ross. “And we suspect they were just in a corner at this point and had no alternative but to take this step.” According to Ross—whose stalwart campaigning has routinely led to clashes with authorities at NYU, the Guggenheim, and the UAE—the museum’s attitude is disappointing, but should not distract from the GLC’s other accomplishments. Since the protest moratorium has ceased, however, GLC’s direct-action wing GULF is now able to pursue full-fledged demonstrations. Another upshot of this conflict is that the disputes between activists and the museum might now fade back, and, with the battle lines redrawn, the spotlight can shift toward the real stakeholders: the workers who have never been invited to the negotiating table. In light of their struggle for dignity on Happiness Island, the activists in New York have hardly been silenced in the debate; they just have a clearer sense now of which side their voice is on.